Whooose birthday is it? Whoooo is turning a year older? This curious and friendly owl seems to say. It is sitting on a leafy branch, under a sky dotted with white clouds. This stylish design is a perfect way to begin your celebration, while the wise old owl, cute as can be, keeps a watchful eye over everything… making sure fun is being had by all. 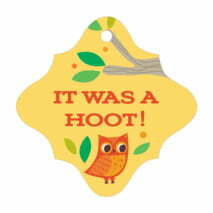 Customize your Woodland Owl kid/teen birthday tags today! Woodland Owl kid birthday tags are printed on extra-thick cover weight white paper and come in a variety of shapes and sizes (including square, circle, a scallop-edged circle, ovals, and other more intricate shapes). Kids birthday tags come pre-punched with a small round hole to thread your choice of tying material. 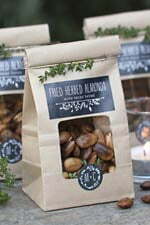 They are punched out individually and packaged as a set in small bags. Choose a desired shape and color from above to begin customizing your Woodland Owl kid birthday tags today!